does it shut-off at overheat? if it keeps running you have a sticky compressor relay (#20 in the fuse box), the RR will not be able to lower and you'll get an exh valve stuck shut code. please download the unlock program and don't waste more cash with the dealerships, they have no interest in actually fixing your EAS, they will just throw more parts at it. I had another service manager call to yell at me last week, because "a valve block can not be rebuilt, it says so in the workshop manual." the leaks I thought about earlier were in teh non-return valves, they won't cause the RR to sink, but will cause problems when the compressor is running if they are leaking by. you said the orings were replaced, I'm assuming they replaced the airline rings only, or was the whole block rebuilt? So far there have been no problems for 4 days now. Testbook says that it is either a leak in the Airtank/line or a faulty pressure switch. I priced a switch from them and it was an outrageous $430. Needless to say I didnt order one. So, anyway if the fault comes back they will check for leaks in the airtank and consider the pressure switch. it is almost NEVER the pressure switch. 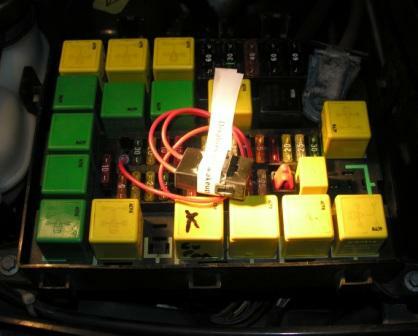 a recurring PS fault is typically a sign of a failing driver module. keep us updated on those relays. I'll keep in mind that its almost never the pressure switch. I see that you have some on your site anyway so I know where to go when I want one. I changed Relay #20 on Monday and I havent had any trouble since, however the problem was intermittent so we will wait and see. I pulled the original relay apart and inspected the contacts. They were badly burned and the relay case had black marks inside it. I am an electronics professional and I can tell you that the relay was bad. On the subject of the heavy duty relay, I would like to warn anyone who is about to cut the mounting tab off one. Be careful or you will cut right through the plastic case. I did that when I used diagonal cutters to remove the tab. Next time I will use a saw or a knife to cut the tab level with the case. I will keep you up to date on the new 40 Amp relay performance. I'd say there's a pretty good chance that was your issue. can one of the mod's boil this down to one post? Height sensor or switch problems with EAS ... maybe? MY P38 seems to hold air just fine and stays at the same height when parked for a couple days. The compressor seems to work when it is suppose to and was replaced about 2 years ago but every now and again I will be driving and when it goes to switch heights (for instance from standard to highway mode) I go into EAS Hard fault. Thanks to Storey and his magic cable I am not driving around on the bumb stops but still I want to troubleshoot the problem but have not seen a similar problem. 2. The up arrow will appear lit on the dash. 4. Then goes into a EAS hard Fault. I'm 99% sure that's the classic sign of the 'Drive Box' (black box bolted onto valve block) failing. I had very similar issues to yours and a new unit cured the problems totally. Can anyone post a link to rebuilding the valve block. A while ago i was having a few problems and i replaced the compressor bought a valve block rebuild kit from Rover Renovations. I have no external leaks but after the car is parked for a while the front rises and sometimes the rear passenger side lowers, so i am presuming i have put the valve block together wrong. As you may know i've rebuilt many valve blocks. One that i rebuilt 6 months ago is causing me some troubles. Owner is encountering the front springs slow dance. If read you well, this is due to leaky non return valves? Can it be something else like worn height sensors? The front end dance is typically leaky non-return valves, it could be a bad sensor though. a session on a Rovacom will confirm a bad sensor. If it's rising with the compressor on, then stops the comp to lower, then comp starts and rises again, open a door to inhibit leveling, wait for the comp to stop and see if it continues to dance. Thanks for last tips but valve block had been renewed so it may be bad sensors. I encountered same thing while using EAS lift box and my valve block has been renewed too. I do have another question : i did a EAS back conversion recently. Started with a rig that had lost EAS ECU and one height sensor. It may be important but previous garage guys changed drive box on warranty. Testbooked and height values setted with height blocks. All worked as it should for 30 miles. Until EAS fault appeared and compressor kept running even with engine off. Very strange. Car was on high height. Seems like a problem of height sensor. EAS fault diagnosed with T4 was exhaust valve closed. That may explain that the car went high height for no reason. Changed compressor for a new. I found that the blue airline compressor to valve block was leaking (it's a classic cause of dysfunction). Changed the airline. Dynamic test of the suspension with Testbook. The car danced like a lowrider. Quick to go up and down. Everything works ok. I tested drive the car on all height at all speeds. No fault occured. The car has done 150 miles since this reset. I think everything has been checked. Should i ignore this fault : "exhaust valve closed" since the car could go up and down without problem? PS : i just checked past messages and found a clue : "if it keeps running you have a sticky compressor relay (#20 in the fuse box), the RR will not be able to lower and you'll get an exh valve stuck shut code. " Mmmm - auto-level is on all the time and has nothing to do with only leveling for leaks. Read up on the main site - there is a cute story about a RR auto-leveling down on to a cooler left under a RR parked on uneven ground overnight while camping which is the other prob - auto-leveling seem to try for the lowest common denominator. It chooses the lowest corner and lowers to try to level around that value (but is limited to max correction levels for each session). So, after a night, the RR may be lower - depending on whether all 4 corners remained relatively equal all night (for whatever reason: leak, temp change, or other) - and may or may not be level - depending on whether or not there was sufficient time for enough auto-leveling sessions for the higher corners to 'catch-up' to the lower. The proper way to check for leaks is to remove the EAS delay timer (read up!) and leave the car sitting overnight. That way, the valve block gets no signals, does not try to auto-level (no the lock switch does not inhibit auto-leveling), and only the corner(s) with leaks will drop - assuming a good valve block. Please take the time to download the RAVE manuals, read up on the EAS, and then go to the main site and read up on the EAS there as well. It'll take you about an hour to do, but it will stop all this silly speculation. - I can only imagine that the rapid dropping in your initial post went through the valve block as your EAS is now (semi-) working and leaks don't magically reseal themselves. Whether the cause is electrical or mechanical, you'll have to find out. - you nearly certainly have a worn compressor. I'd be willing to speculate that a new compressor seal will temporarily solve most of your probs - you'll be wearing the new seal quickly tho as the compressor compensates for leaks. Sorry if I seem a little short tempered, I am trying to help but it's frustrating watching all this silly back and forth where a real solution is right here and within your grasp. I have a driver from a classic, I'll try that and see how it goes. What is the order of the solenoids on the valve block? I suppose starting from the front of the vehicle with the one with the blue leads ('A' in rave I think) and working towards the windscreen. And while we're at it I what are the order of the air pipes exiting the the valve block. Previously pampered 98 P38 dHSE about to get a rude awakening in the mountains of Munster! Having spent a bit of time on it last night, its a bit obvious which is which so I now know which one is the right rear, of course as Murphy's law would have it its one of the ones underneath so I'll have to take out the block to check it. Anyway I suppose a guide wouldn't do any harm so if anyone knows exactly the order of the valve solenoids they might post it here. 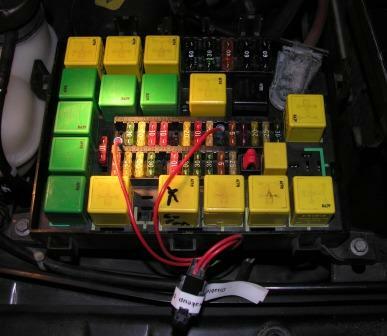 Read the docy and you will understand - You can get your garage or sparkie to make you one - PLEASE LABEL THE FUSEBOX and CABLE if you make your own as most garages wont know its there and you will pay em to find it.